I missed my deadline by four days, sowing onion seeds on February 5th rather than the planned February 1st. That date isn’t fixed in stone but the important thing is to plant onions early. Onions are photoperiod sensitive, that is, they respond to daylength (actually, night length, but researchers originally thought the response was to light rather than darkness, so the phrase “daylength sensitive” stuck). Once days get long enough, sometime in June, leaf formation comes screeching to a halt and the plants put their energies into making bulbs. The more leaves before that begins, the bigger the bulbs. Plants from seeds sown outdoors — towards the end of March — won’t have as many leaves as plants given a jump start indoors. I like big bulbs; hence the early February sowing. First step on my way to onion-dom is to get fresh seeds. Onion seeds are relatively short lived and I want to give the plants plenty of time to grow. I don’t risk delays from poor germination and replanting of old seed. 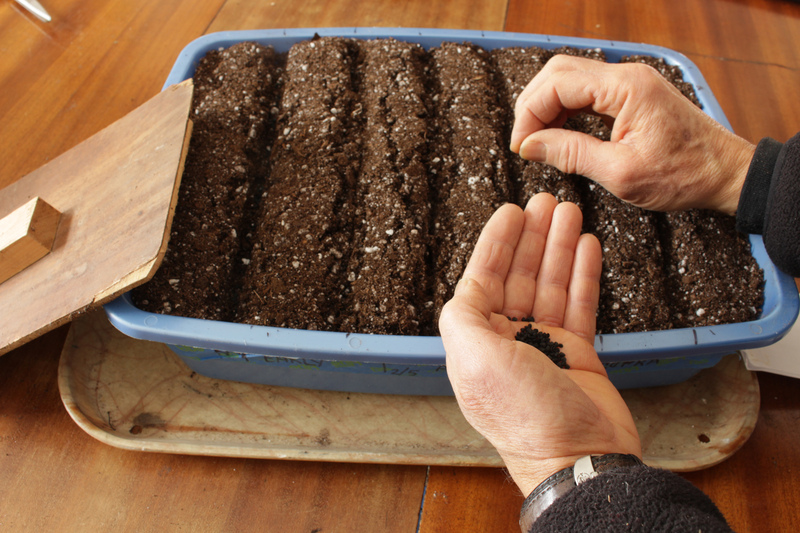 Seeds get sown in a miniature “field:” A plastic tub 18 inches by 12 inches, with drainage holes drilled in its bottom and filled 4 inches deep with potting soil. Some weed seeds are unavoidably lurking in the garden soil and compost in my homemade potting mix, so I top the potting mix with a one inch depth of a weed free, 1:1 mix of peat moss and perlite. The edge of a board pressed into the firmed soil mix in the tub makes furrows, 6 of them equally spaced and about 1/2 inch deep within the tub. Into each furrow go onion seeds, sprinkled at the rate of about 7 seeds per inch. Once the furrows are closed in over the seeds, I water thoroughly and, to avoid washing away seeds, gently. 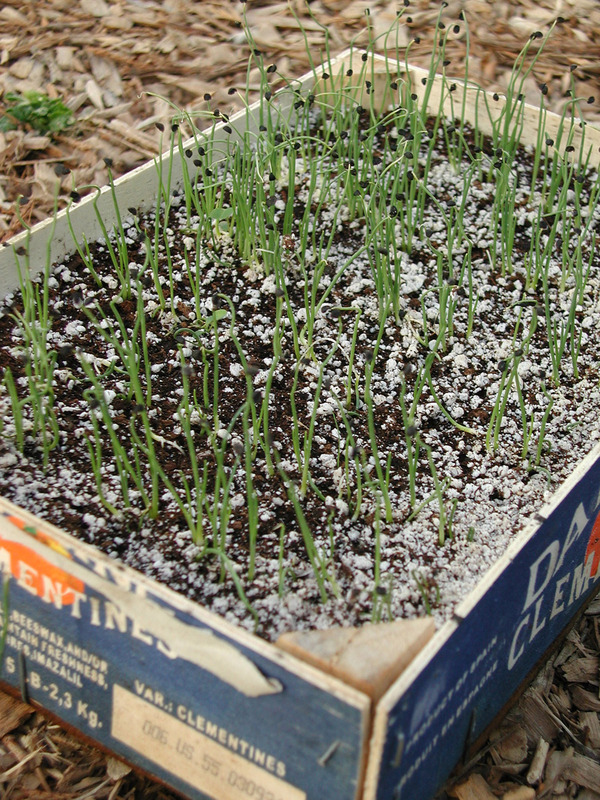 Covered with a clear pane of glass and warmed to 70 to 75° F, the seeds should appear as grassy sprouts above the soil mix within a couple of weeks. From then on, my goal is to keep the plants happy with abundant light and water as needed. They get a haircut, their leaves snipped down to 4 inches, whenever they get too floppy. The compost and alfalfa meal in the potting mix should provide sufficient nourishment to the seedlings until they are ready for the great outdoors. That deadline is April 15th, weather permitting. Onions won’t be alone on the seedling bench in the greenhouse. I’m also now sowing seeds of celery, celeriac, and leek. All, like onion, need a long period of growth before they’re ready for outdoors. Onion seedlings, up and growing. These seeds get sown in furrows in small seed flats from which the seedlings, once they have two leaves, are gingerly lifted and cozied into waiting holes poked into the potting mix filling seed trays with individual cells. Little growing space is needed because a single seed flat can be home to a few kinds of seeds and the celled trays in which the seedlings grow until planted outdoors can house about two dozen plants in a square foot. I’m sowing lettuce in a similar manner. In contrast to celery and company, lettuce grows quickly. It’s needed to fill in gaps opened up from winter harvests of kale, lettuce, mâche, claytonia, celery, and parsley in the greenhouse, and should be ready to eat in April. Last year’s onions were abundant, large, sweet, and juicy. Anticipating their not keeping well, we ate them quickly, pulling the last ones from their hanging braid in the basement sometime in November. These were so-called European-type onions, varieties such as Ailsa Craig and Sweet Spanish. Next year we should have fresh onions for soups and stews on into winter because I’m growing some American-types, New York Early and Copra. American-type onions are actually sweeter than European-type onions, but their sweetness is masked by their increased pungency. That pungency comes from sulfur compounds, which are vaporized during cooking. Those sulfur compounds are also what help these onions keep longer. Soil enters the picture when it comes to onion flavor and storability. Sulfur is an essential plant nutrient and the more sulfur in the soil, within limits, the more sulfur in the onions. Sulfur is a key component of organic matter, so my compost-rich soil (with a whopping 15% organic matter) should have plenty of sulfur. Still, I’m thinking about spreading sulfur, the same pelletized sulfur I use to maintain soil acidity beneath my blueberry bushes, on half my onion beds to see if flavor or storagability are noticeably affected. This entry was posted in Gardening, Soil, Vegetables and tagged arugula, lettuce, mâche, onions, photoperiod, sulfur. Bookmark the permalink. Trackbacks are closed, but you can post a comment. So regarding your comment on onions being photoperiod sensitive: I have onions started under grow lights in the basement doing quite well thank you. I have transplanted some of the bunching onions already into pots. My question is the length of the grow light time. I currently have the lights set at 12 hours. Is that too much for the early seedlings? Should they gradually be increased to 12 hours? The correct duration of light depends on what kind of onion it is: a northern, southern, or photoperiod insensitive type. Oh yes! I used to plant in furrows and cover. I now I use a plastic container from grocery store spinach or lettuce fill 1/2 way with soil, broadcast the seeds and cover with vermiculite soil mix. The containers already have a cover with them. I have also had great success with the roast chicken containers. Just sowed my onions this week – last year I didn’t sow them until March 1st but they still did fairly well. I grew two storage types – Copra & Rossa di Milano – as well as the Ailsa Craig. 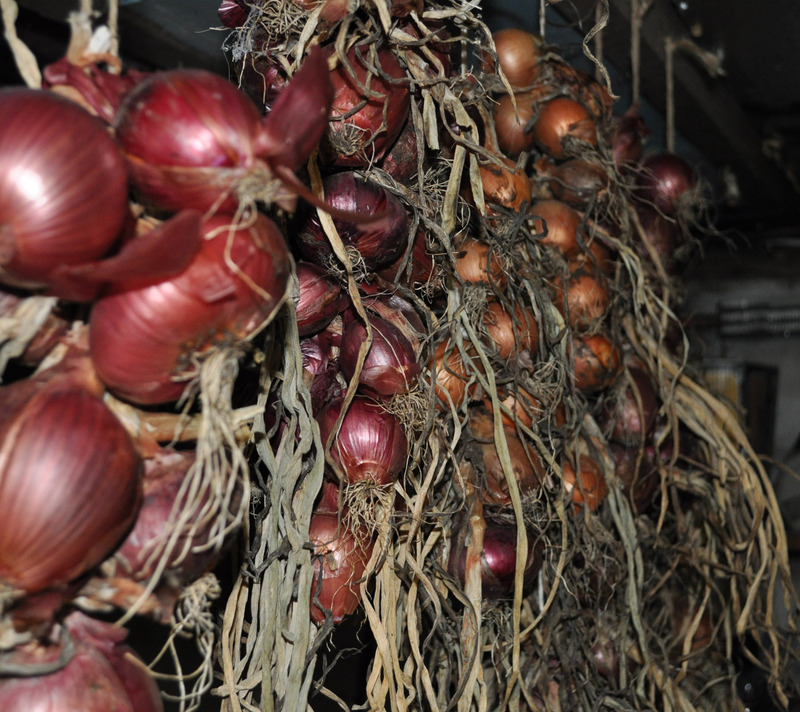 The storage types gave me smallish to medium sized onions, averaging around 142 grams & are still doing very well hanging in my basement. The Ailsa Craigs were huge, averaging around 300 grams with one tipping the scales at 756 grams! It was my first time growing onions & I was thrilled. This year I’ll be trying to repeat the success of last year, so I’m hesitant in making any changes. My planting out date is mid-April as well, so I did decide to push back the date to mid-February, for the very reasons you stated above. If all goes well, I may go back to February 1st next year.